“Mom” at Tiny Green Mom was fortunate to have stumbled upon a fantastic cookbook and guide for consciousness in cooking for your precious little ones, and have the opportunity to review this new resource that is fast becoming a family favorite! Organically Raised: Conscious Cooking for Babies and Toddlers by Anni Daulter is simply phenomenal! Anni is a professional cook and mother of 3 who shows us all how to cook with purpose for our children, creating wholesome, nutritious and delicious meals that are free of pesticides and packed with flavor. Her recipes are simple to make and inspired by her own children and their friends – these are tried and true recipes that your child will adore, too! 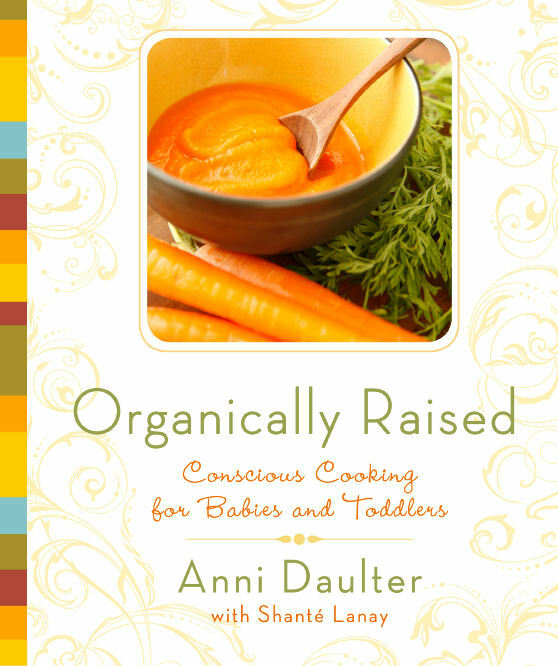 In addition, Organically Raised: Conscious Cooking for Babies and Toddlers offers informative chapters on special diets, healthy mix-ins, and insights into transitioning your baby beyond purees into an adventurous eater. This is one wise mother! This week, Tiny Green Mom will be featuring recipes from Anni’s cookbook. Please stop by for the Recipe of the Day, or order a copy of Organically Raised: Conscious Cooking for Babies and Toddlers of your own to nourish your family online at Amazon.com, Barnes and Noble, Borders or IndieBound.org. Babies Hits Theaters Mother's Day Weekend! I wanted to take a moment to thank you for the review and say that if any of your readers have questions, please let me know. I can also provide you with actual pictures of my recipes if you need those while you are featuring some of them.